hitRECord is the baby of the actor Joseph Gordon-Levitt. It’s one of those cooperative internet projects where people from all over the world collaborate in the fields of music, art, film and writing. If the final result is profitable, any money made gets split between the company and the contributors. The Tiny Book of Tiny Stories: Volume I is the first of a three-part series published by !T Books, an imprint of Harper Collins. The stories really are tiny, examples of flash fiction in its most naive form. Writers post their stories to the hitRECord site and artists choose from among them which ones they want to illustrate. It’s an interesting exercise, but to be honest it was the cover that caught my attention – a bright, vibrant red with a black line drawing that seemed strangely familiar. And suddenly I realized where I’d seen it before! The little guy reading the book resembled a subversive Sanrio character (think Hello Kitty, My Melody and Little Twin Stars). In actuality, wirrow is on the cover – artist, illustrator, musician and (I guess) patron saint of the Tiny Stories project. The book is filled with word-play like “Okay, I’ll admit it, I have a few skeletons in my closet; but they weren’t skeletons when I put them there.” and “In winter, when the leaves have gone, the owls swoop in to keep the trees warm.” and (my personal favorite) “The element of surprise wasn’t allowed near the Periodic Table.” You need to see the the book in person to get the full effect. Because it’s the combination of words and pictures that create the unique experience that is Tiny Stories. Rough, edgy and – for something that might have easily been dismissed as “hipster” – jam-packed with heart. There’s an honesty and (strangest of all) innocence displayed in both the writing and the artwork. It kinda’ reminded me of Valentines Day back in grade school. When everyone passed out those paper Valentines that came in a box from the supermarket. Every one of these tiny stories holds that kind of surprise. Read and smile. I love those tiny story videos. So cute…. The word play made me laugh! I want to find this book. I laughed too, which was why I requested a copy. 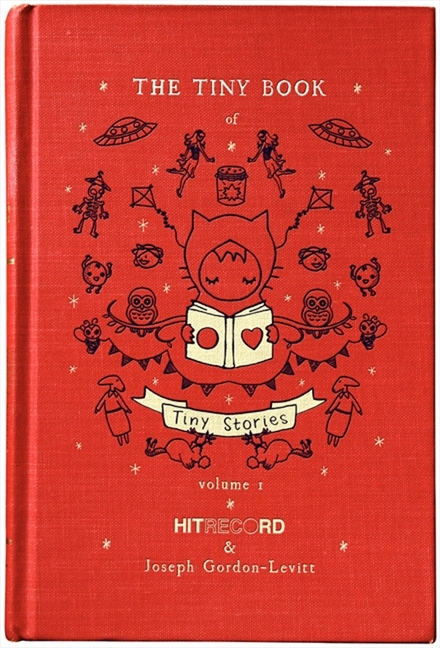 You should check out the link to the hitRECord site – there’s tons of videos, drawings, etc. on there. Thank you for the comment Stacja. I’m glad you enjoyed the review.